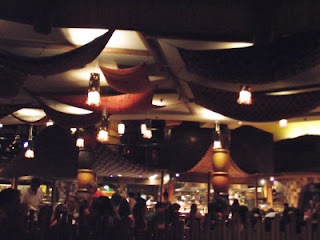 Hubby and I had a good dining experience at Boma at Walt Disney World. This was the first time we tried African food so we didn't know what to expect. The good things we heard about Boma made us want to try the restaurant. I couldn't believe that it is on the Disney Dining Plan. That convinced us to give it a whirl. Boma - Flavors of Africa is a buffet in the Animal Kingdom Lodge. The whole place is built to resemeble a lodge that you would find in Africa. Just walking in is a treat for the senses. All of the walls shine with highly polished carved wood. The beating drums and unique second floor gift shop help set the stage for what comes next. Maybe that's why we had to book six months in advance to get our second choice of time and date? The restaurant is on the bottom floor. Boma decor reveals the same theme that is evident throughout the resort. Drums beat constantly. A large kitchen window lets you watch the chefs at work. I was intrigued but sad that we didn't get a good view. Our seats were near the back of the restaurant. Boma was seated to capacity so alternative seating wasn't available.